It is really sad that half of us will get divorced. And a huge percentage of those of us who stay married are simply enduring bad relationships. We all think we are different, but the reality is that maintaining a long-term happy relationship takes real skills. This week’s video gives you 4 concrete steps every couple should be doing from the start to support their relationship to thrive. And a couple of stories of how I have struggled and survived in my relationship. Watch more videos at Full Frontal Fatherhood. If you are reading this you probably know how challenging relationships are. They require us to have a team that can function through all the intense difficulties of having kids and going through life. Few of us are taught how to foster that type of teamwork and all too often the team fails in the face of those stresses. Even though divorce is a horrific process that causes immense amounts of pain, the fact that 40-50% of us will get divorced at least once is proof of how bad most of our relationships are. The numbers show that we lack the skills to make our relationships survive, let alone thrive over the decades. Today I would like to talk to you about what the problems are and what are some solutions so you can prevent that situation from happening for your family. The primary reason why relationships end up in failure and divorce is because we stop being able to work with our partner as a team. The relationship stops being able to handle the difficulties. Usually this is because we are not able to talk to our partners about the real difficulties. Why is it at the beginning of a relationship it is easy to talk about the challenges, but later on in a relationship it becomes much harder? Usually this is because the hurts build up and pain is left unresolved. We get hurt in little and big ways throughout the relationship and if our team does not have the ability to talk and resolve those issues then it leads to a bigger and bigger divide in the team. Soon all we see is the person from a distance, behind a filter of resentment. We forget the part that we love. We lose contact with the wonderful person that we originally fell in love with. This actually happens for me with some regularity. My wife and I will get in the middle of some fight and pretty soon I hate her. I cannot believe she is saying the things she is saying to me and I cannot believe how unsafe I feel with her. I forget in that moment how much I love her and all I want to do is get out and run. Divorce looks pretty attractive. Fortunately, I know that this is what happens for me and at the same time I am watching myself have these thoughts and I do not believe them. I have been through this dynamic enough to know that within an hour or two we will have resolved the issue and I will return to loving her, possibly even move for having worked through the problem and having been vulnerable with one another. Still it blows my mind how in that moment I hate her so deeply, and if I did not have that solid thought of, “I can work this out with her. I know that I actually love her and I will get to that other side,” I would easily go down a road that would lead to a worse and worse situation. It is this lack of experience and trust that conflicts can be resolved that leads both to getting more defended and uglier, and brings us to stop nurturing the relationship. Once the downward spiral starts, it becomes harder and harder to feel safe and close enough to love your partner. Divorce becomes a very viable option. The second reason why divorce becomes the best option and our team fails is because we are taught to love based on our experience with our parents. And for a lot of us that didn’t go so well. We learn how to bond when we are very young, primarily before we are three! How we were loved teaches us how to be in relationship. Our first relationships, outside of our family, are often with girlfriends and boyfriends that don’t really trigger our baggage. Our patterns and woundings don’t typically come into play until we are in more intimate and complicated scenarios. Once we are living together, possibly married and possibly with kids, our old programming really gets brought to the forefront. This is simply because we aren’t that invested when we are just dating someone, no matter how much we are in love. Once we are spending everyday with a person and our future feels tied to theirs, we can find ourselves feeling really uncomfortable and playing out a dynamic that is almost always a reflection of how we were raised. We end up treating the other person in ways that actually have a lot to do with how we were treated as a child. When two people are doing that at the same time this can lead to a lot of friction and pain. A couple’s ability to handle this friction is usually pretty minimal because we are not taught the skills of how to resolve these deep wounds and free ourselves from our childhood programming. One of my worst moments is when I am struggling to hold a boundary with my daughter and my wife says I am being too harsh and starts treating our daughter in a ‘softer’ manner. It sends me into livid land and it really triggers a deep part of me. If I wasn’t so triggered, I could say, “Hey, I feel hurt, can we talk about this?” But I don’t because I feel so upset and angry in a way that is clearly disproportionate to what she is doing. Surprised by my level of anger, I have taken the time to explore why my reaction is so intense. I’ve thought about why and given myself space to feel the emotions that arise in that moment. I came to know that it is because of my own childhood. I remembered moments when it got really ugly between my parents in very similar moments, combined with a lot of memories of being told I was doing something wrong. By doing this I’m moving out of the victim role of blaming my wife which just perpetuates the fight and into a position of power relative to my emotions. I understand why I get so triggered and I have told my wife so she can understand my reaction which supports her to not react as defensively as well. This type of historical baggage causes us to be far more reactive. In those moments if we understand what is at play we are far more able to handle the intense feelings and not just act out of them. Unexplored intense reactions due to our history really are the trailhead of the path of divorce. 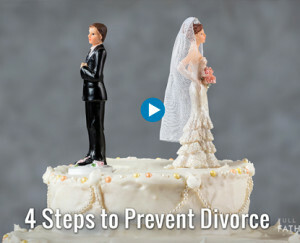 Here are four things that anyone can do to prevent their relationship from ending up in divorce. The first one is creating a space where you and your partner can really talk about the hard things that have happened in your relationship. You may say you have attempted to talk to your partner, but did you really create a space where they could hear you? So often we say something when it is not a good time. It just triggers the person and of course their defenses come up. If you can create a space where they are available to hear you it is deeply healing. My way of doing this is to go to my partner and ask her to listen to me. I say, “Hey, I’m really struggling with something. Can you just listen to me while I get this off my chest so I can feel closer to you?” By both asking for space and stating my intention, she is far more likely to give me her attention in a less defended manner. Her compassion is more likely to come forward and she will be available to hear me. She will be able to keep her own defenses in check because I have asked her to just listen. Even if she is having reactions within herself she knows to keep it to herself for now and just be present with me. Then take that space to really share what is going on for you. Do not worry too much about saying it right, just get out what is happening for you. Share the hurt, share your anger, share your pain. As you get it out, it will come to calm down as you go through it all. If your upset is not coming down then share it again because there is some way in which you feel the other person is not really hearing you. Maybe they are not looking you right in the eye or they do not seem really present to you, and you can tell them that. Share what is going on and how you felt hurt and let them hear you. Give yourself the space you need. So often we cut ourselves off too early after we have said a few hard things. Then we have just said hard things to our partner and it is going to leave them with hurt. When I take the space to express my hurt or upset with my wife, it usually starts with blaming her. After I have gotten the blame out and some of the anger, I naturally start to notice my own responsibility for the situation because I’m not just caught up in feeling hurt. Once I have acknowledged that usually there is a lot of love and appreciation that comes out. If you haven’t gotten to a feeling of appreciation and love, at least a little bit, then keep working through that hard stuff. It will come. As you can imagine, this often is not enough and so the second thing that you can do is to look at your history. What is getting triggered here? How does this reflect your childhood or your past woundings? As I described in my personal example above, feel your hurt, your vulnerability and your reactivity. Notice how you want to just blame or distract yourself and make an effort to turn your attention to the uncomfortable emotions. It can help a lot to support this process through journaling, talking to a friend or seeing a therapist to understand and resolve your hurt. The defensiveness that may be coming up within you might have very little to do with what your partner is doing. Maybe there are even things that you do that invite your partner to treat you poorly because of the way you treat them in your defensiveness. By taking the space to look, we can find a world of information and become far more empowered relative to our feelings. It is unfortunately likely that your partner is also being overly reactive due to their history. If you can each look at your own history, feel it, explore it and even share it, then you stop being so much the victim of your history and start to gain some power in relationship to it. Sometimes everyone needs to see a couples therapist. It simply really helps to have someone trained join you in this endeavor, create the space where you can really hear each other and work through the past hurts. Whatever resistances you have to a couples therapist, look at them and do what you can to not have them stop you. Sure there are mediocre therapists out there, but therapy really helps. As with any undertaking, whether it’s golf or rock climbing, if you want to do it well, hiring a professional trainer really helps. Yes it feels really vulnerable to go to a stranger and lay out your relationship including things you may feel shame about having done, but what better place to apply one’s courage? And the sooner you can do it the better. All relationships can benefit, just as even the best baseball players still get help from experts. What has really saved my relationship with my wife is that since we have had our daughter we have regularly take an overnight to get away and experience each other anew. A date night really does not cut it in my experience. You go out, you are tired, eat some food, you chat about a few things, you feel like going to bed. With an overnight, you have the space to really see each other and enjoy each other in the way that feeds your heart. You have the time to not worry about the kids, have the space to take a nap, have a drink together and really talk. Talk about what has been bugging you or what is on your mind. Connect emotionally, have physical intimacy, sleep, play together, enjoy each other. Wake up in the morning, have some room service and maybe even some more physical intimacy. It is amazing how every time I do this I am still surprised at how much more I love my partner, remembering the joy that we can have together. It is a joy that is really hard to have when the kids are around and daily life is pulling on you in lots of different ways. If your relationship is on the verge of divorce or you just want to prevent it from happening down the line, use these four things to make sure that you can have a thriving relationship with your partner. Take the space to really create conscious communication with your partner so you can have a thriving team. When you have problems that are deeper from your own history, address your own wounding. Get a therapist because it really helps to have a third person in the mix. Get really regular, fun time with your partner so you can remember the joyful loving aspects as well. Thank you for joining me for another episode of Full Frontal Fatherhood. I would love to hear how you avoid divorce. Please join the conversation below and I will see you next time for another episode of Full Frontal Fatherhood.